Whether you are in search of a fairytale sparkling Christmas or you are looking to find a place to defrost from the cold December chill, I firmly believe that New Orleans is one of the best places to enjoy the holiday season. If you want authentic Southern holiday decorations, decadent Christmas food, rich family traditions, and mild, bearable weather, New Orleans simply can’t be beat. The best Christmas vacations are right here in the South. Folks in the Crescent City know how to spice up the holidays with just the right mix of tradition and surprise. What better way to spend your Christmas vacation than roaming the French Quarter alongside canopies of colorful Christmas lights? Or driving through thousands of oak trees dripping in millions of lights? Find a classic Christmas musical tradition, the St. Louis Cathedral Concerts, right on bustling Jackson Square and you might even encounter some historical characters roaming the streets. For a warmer celebration, enjoy cocktails at the Roosevelt Hotel or watch a cooking demonstration at one of the city’s finest restaurants. For classic Christmas celebrations, a magical Teddy Bear tea, brunch with Santa, and holiday courtyard tours are unbeatable. 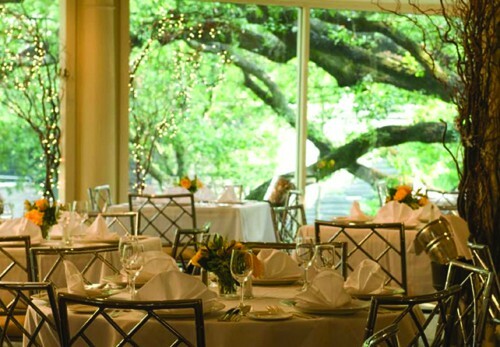 Forgo the skis and head to Louisiana this winter to celebrate Christmas. 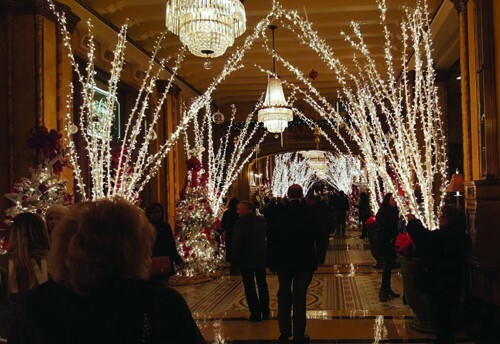 Here are our picks for what to see, do and eat in our favorite Southern city at Christmastime. The city of one thousand amazing restaurants dishes it out for the holidays. The Reveillon menus are offered nightly during the Christmas season in many restaurants with prix fixe, special-occasion menus. If they don’t offer a Reveillon menu, there are always special scrumptious holiday offerings to be enjoyed. We ate and swooned at these lovely establishments: Ralph’s On the Park, where our brown butter-glazed redfish is still a luscious memory; Cafe du Monde, sugar-snowed beignets and coffee with chicory, matched with the most amazing people watching ever; Central Grocery, home to the most classic of muffulettas - warm, cheesy and atop to-die-for bread; Mothers’, authentic home cooking and do try the crawfish etoufee omelet; Brennan’s, where I was treated like the Queen of England and ate every bite of an amazing gulf fish amandine and cheddar risotto; Galatoire’s, decked in Christmas ornamentation and home to fabulous seafood; and Commander’s Palace, where we were thrilled to meet co-owner Ti Martin, listened to live jazz, and enjoyed pecan-crusted fish, mimosas and mighty fine service. There are so many holiday activities in New Orleans that a guidebook is published each year, listing them all. Some of the more entertaining include a Jingle parade, a reindeer romp, the bonfire party at Oak Alley Plantation, Christmas Eve on the Steamboat Natchez, haunted history tours featuring the ghosts of New Orleans, tree lightings all over town, theater, orchestra, jazz and all kinds of musical performances, the Holiday Doll Tea party and the National WWII Museum’s Teddy Bear Tea. We loved having Brunch with Santa and his Elves at the Bourbon Orleans Hotel. Glorious children in gorgeous clothes on their best behavior entertained us almost as much as the lovely singer who performed through brunch singing all the great Christmas carols. Can it get more magical than a slow drive through City Park where millions of lights adorn the historic oak trees? Celebration in the Oaks offers themed displays throughout the park; going here is a family tradition for thousands of New Orleans families. Each year, The Cathedral-Basilica of St. Louis King of France, the oldest Catholic church in continual use in the U.S., arranges a series of free holiday concerts showcasing spectacular acoustics in a spectacular setting. 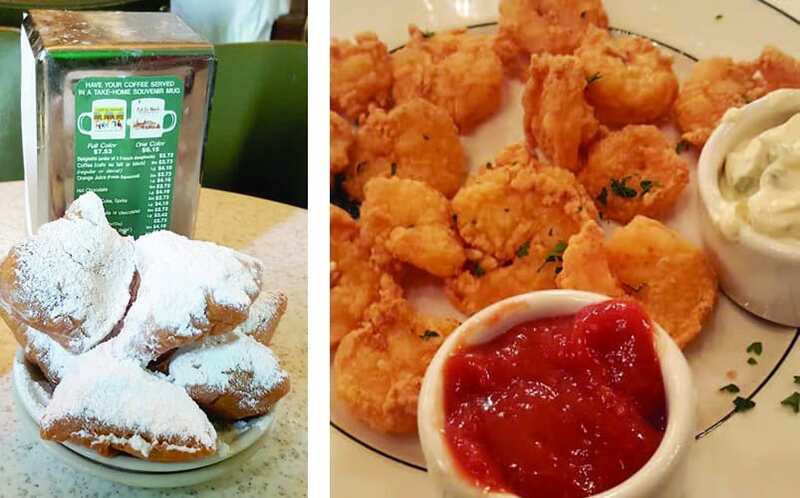 Most folks who go to New Orleans wander down to The French Market, usually after enjoying a plate of beignets at Cafe du Monde. The market is part flea market and part farmer’s market, depending on the day. LUNA Fete is a multi-day celebration, free and open to the public, and features illuminated installations, digital sculptures, video-mapping projections, and art animated by technology – intended to engage and inspire audiences of all ages. Holiday Home and Courtyard Tours, presented by the Historic New Orleans Collection, offers a peek into the past of one of the French Quarter’s most historic homes. Touring the famous Roosevelt Hotel’s decorated lobby, we witnessed a marriage proposal! And sipped a Christmas cocktail from the Sazerac Bar called Santa’s Candy Cane. Festive! The live music is just as wonderful on Frenchmen Street as on Bourbon Street, but without the over-the-top atmosphere. 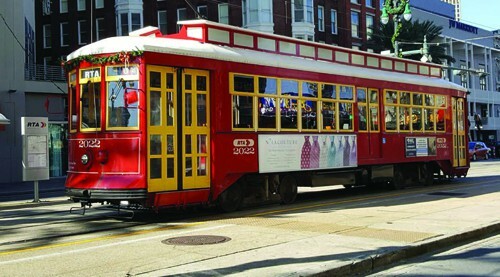 You can’t go to the city without taking a ride on the St. Charles Streetcar, where your feet can rest and your eyes can take in some of the most splendid homes in the city. Antique shopping on Magazine Street is pure pleasure. And need I say that a few hours spent at Harrah’s Casino is a blast, and you might even win some Christmas cash? 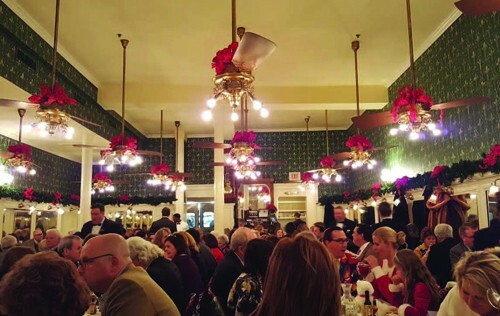 For a complete guide to Christmas New Orleans Style, go to .